From Victor Salva, the director of “Jeepers Creepers,” comes “Rosewood Lane.” And scary movies need creepy posters and trailers, that’s a fact. With a tagline of “Evil dwells in the most unlikely places” being displayed prominently in the artwork for the film, the creepy factor comes off. When a tagline is forcing the scare tactic down your throat, I usually find it’s over-compensating, especially when the graphics include a close up of an eyeball; that, to me, is entirely overdone. However, before I lead you to believe that I don’t like what is being shown for this film, let me point out what makes me look past the cliches. I enjoy the fact that perhaps filmmakers are keen to the thinking of their target audiences and thus blatantly playing up the cheesy component, enhancing the ability to drop an audiences guard and truly scare the heck out of them. I also enjoy the scattered words around the tagline and images, it makes you look closer as you try to read said random words. I do find the figure of a person next to a bike to be quite eerie which is always a plus in horror marketing. Plus, I admit I may be bringing forth a biased opinion, as Rose McGowan is starring in “Rosewood Lane,” and I am a fan. I will be keeping an eye on the developments on this one — I simply can’t resist horror films. 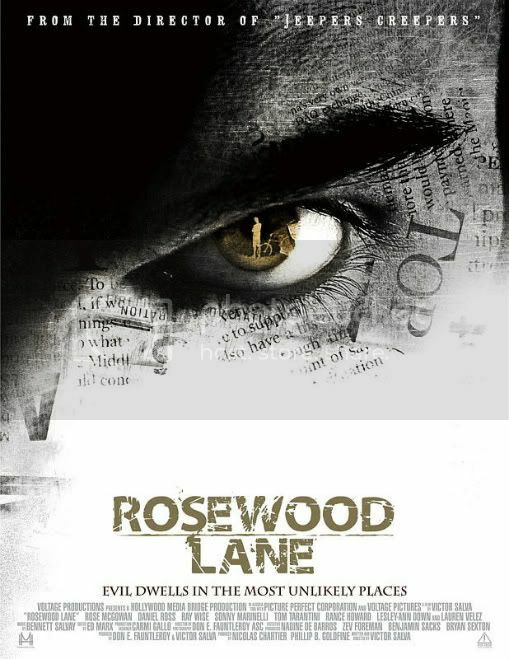 For more about “Rosewood Lane,” check out www.rosewoodlanemovie.com. Simple poster, have to wait to read more about the actual plot before I know if I want to see it. I do love some Rose McGowan though!